Many know that I’m the leader of the 2nd Port Elgin Pathfinders which means I love to camp! It has taken me a few years to finally figure out this camping thing – before I became a leader, my idea of camping was a trailer. Now that I’ve figured it all out, we threw a curve ball in there: camping with an infant! This past week, the 2nd Port Elgin Pathfinders went camping at Camp Wyoka in Clifford, ON. We had a great weekend but one thing was different: our newest addition, my ten-month-old son! It was an amazing weekend, with some minor difficulties thrown into the mix. Lots of snacks – Really important to have quite a few snacks on hand as the little ones get hungry like no other. Throw your sleeping plans out the window – I had a plan for him to sleep in his snowsuit so he wouldn’t get cold. It got down to 5 C at night, and he wouldn’t sleep in his snowsuit. I didn’t sleep much. You won’t sleep much – Whether you’re worried about how they are sleeping, if they are cold, how other members of your camping crew are doing or even if they are stealing your blankets, sleeping bag and pillow: expect no sleep. Backpack carrier is a must have! Bring along favourite toys – We brought a truck that my son loves. He happily pushed it all over the camp site during free time. Any downtime in your day? Let them roam! It was a fun-filled day but I had an hour downtime and I let him out of the carrier to crawl around and blow off some steam. He was in that backpack carrier all day after all. Taking him camping was a blast and he even earned his very first badge. We gave him a Girl Guides of Canada First Time Camper badge. It will go on a blanket which I plan to get for all his Scouting badges when the time comes. Give it a try, take your little ones camping! *This post was originally shared by Guider Natasha on the blog 98 The Beach. Thank you Natasha for letting us share this with our audience! 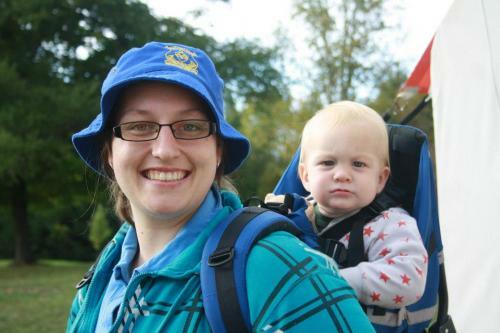 This entry was posted in Girls' Guides and tagged baby, camping. Bookmark the permalink. I took my daughter camping with my Guides when she was 7 months old. My sister came along to help out with her as I was the Guider in Charge. Loved the times when I could take a break to breastfeed my daughter! It also got me out of a waterfight – girls vs Guiders! That babe now has a Spark of her own!! Thanks for sharing. My son started attending Guides when he was 5 months old, and although I haven’t taken him camping with the unit yet, this is good motivation for me not to have to miss a camp!